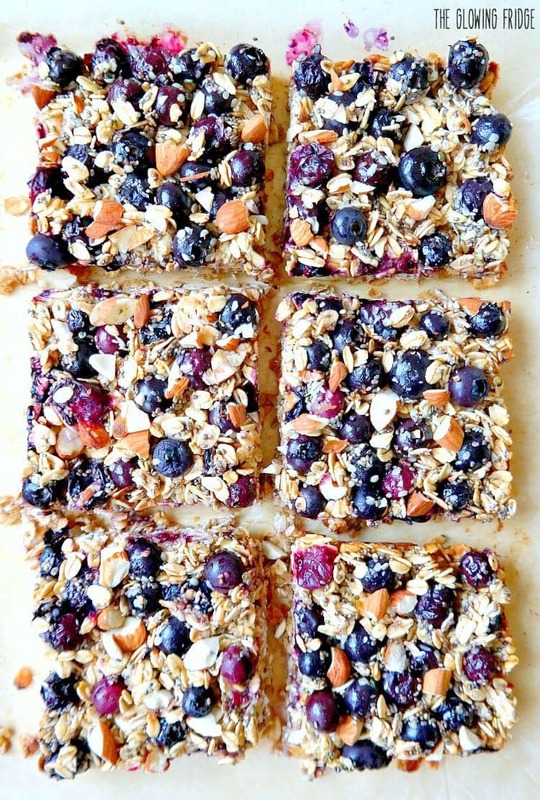 Balanced, wholesome and clean, meet these yummy Blueberry Oatmeal Breakfast Bars. 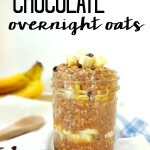 They’ll become your newest healthy breakfast addiction! 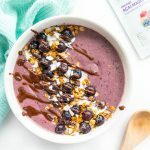 Most mornings, I’ll blend up a green smoothie or smoothie bowl for breakfast, but you know those days when you want something to eat as well?! 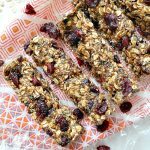 These superfood bars are perfect for those times when just a smoothie won’t cut it or for the days when you’re totally bored of oatmeal. 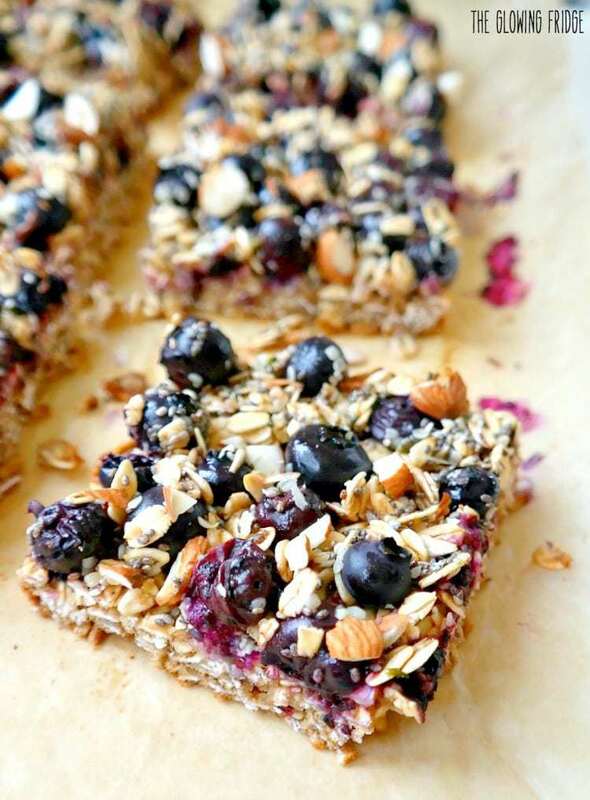 With chia seeds, hemp seeds, whole grain oats and even a scoop of plant based protein powder (this berry protein powder is my FAVE ) they’re filling with high-quality fiber, plant protein, good omega’s, lots of vitamins and minerals. Nutritionally balanced and super nourishing, they’ll give you sustained energy until lunch. Perfect, no? 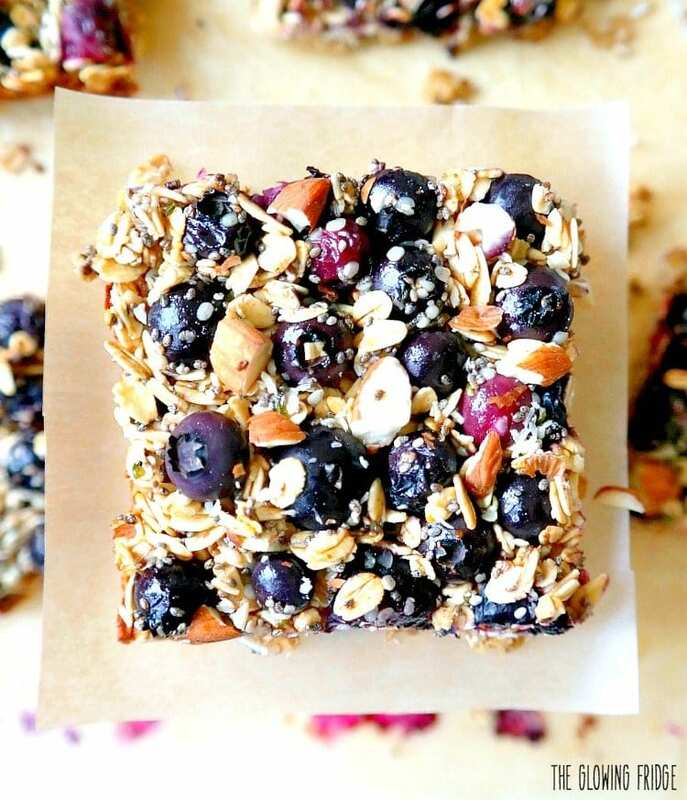 Crunchy on the outside and chewy on the inside, they are superfood bars you can feel good about. A little morning pick-me-up homemade bar! Can also be a yummy snack or pre/post-workout bite too. I love to make a batch while meal prepping on Sunday; they can be refrigerated for up to one week. YUM! Since my snack bar obsession has gotten a little out of control, I figured it was time to start making my own bars at home. I don’t know what took me so long?! They turned out wayyyy easier than anticipated. The plus side? You get to control ALL of the ingredients and the level of sweetness. I love Larabars but some of them can be overly sweet and taste more like a candy bar… nothing wrong with that (!!) but I’m not trying to get a sugar buzz first thing in the morning, ya kno? So for this recipe, I used brown rice syrup which is slightly less sweet than actual sugar, thicker than agave nectar and works as a cheaper alternative to pure maple syrup which tends to be pricy. They’re naturally sweetened with mashed banana, applesauce and cinnamon as well. Eating oats for breakfast will give you the strength to power through your day, help stabilize blood sugar levels, fill you up with high quality whole food fiber and provide balanced plant protein. Add superfood chia seeds and hemp seeds to the mix and you’re golden. Last minute, I decided to sprinkle on some crushed almonds for extra crunch, but feel free to omit those if you want to keep them nut-free or you can switch it up with whatever you have on hand such as sunflower seeds, walnuts or pecans. 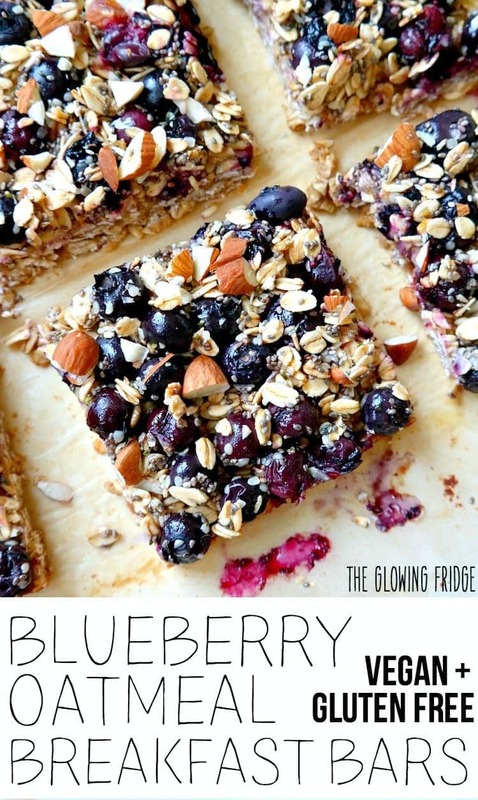 You are going to love love love these yummy breakfast bars! Especially when your kitchen smells like a bakery. Mmmmm! 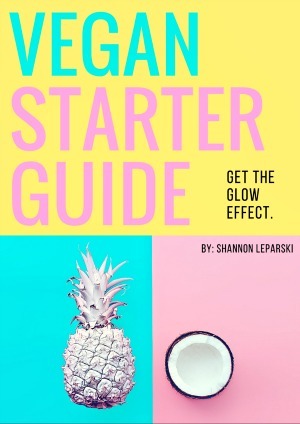 Previous Post: « Blood Test Results and New Vegan Staples Video! 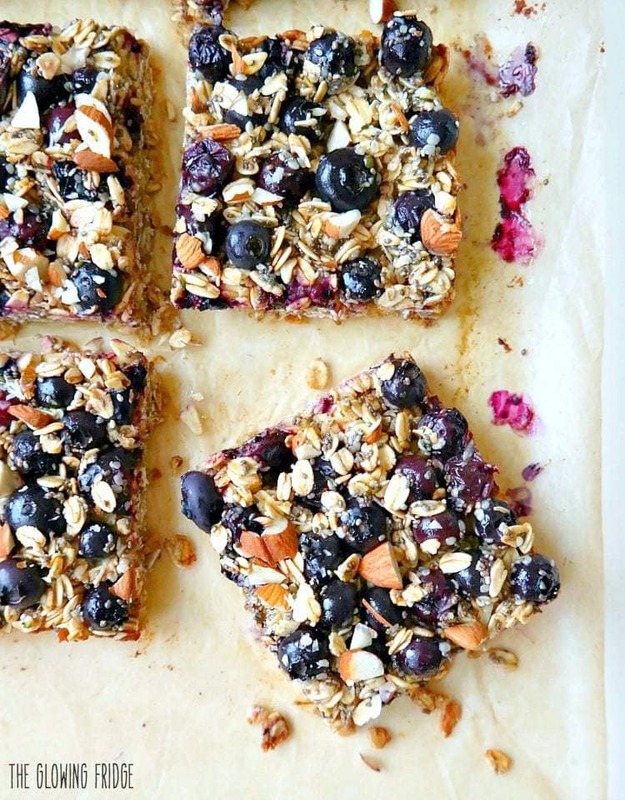 Could you use frozen blueberries? Yes you could use frozen blueberries! Just ate my first bar. DELICIOUS! I warmed it up and topped it with a small scoop of yogurt. Thanks for the recipe! I thought the bottom layer was dry, so I thought I’d try 2 bananas rather than 1 for my next attempt at this recipe. The next day, however, they were better. Gave 2 to a friend to try and she agreed that the second day is the best day. I’m still going to try the 2 bananas. Very good flavor and a nice change from oatmeal. Do you have any suggestions for a banana substitute? Hello there! Your recipes look amazing! 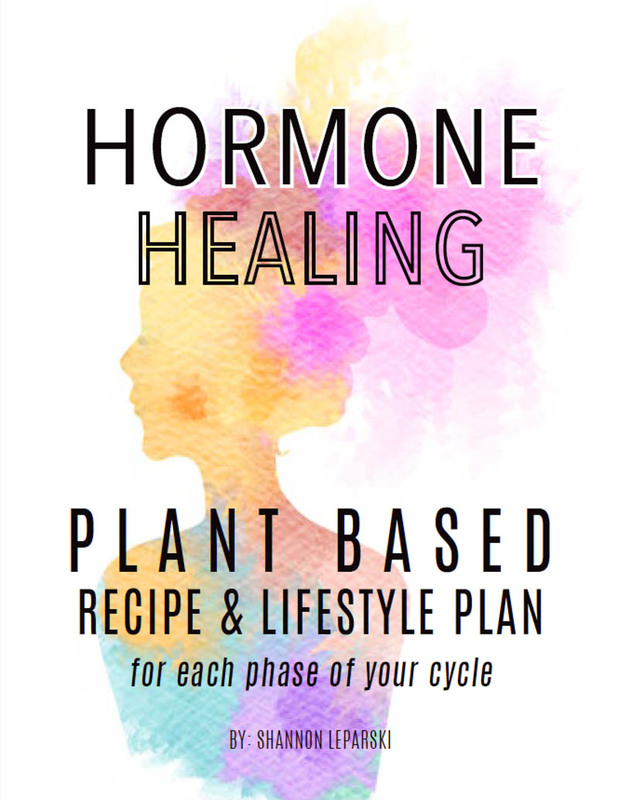 My husband and I just started the Plant based lifestyle. We were told you can’t have any oil. 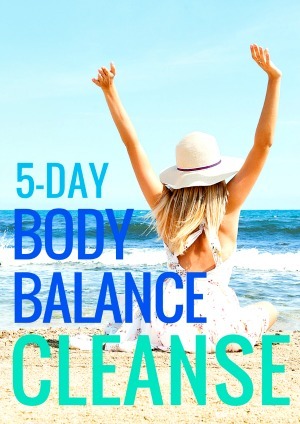 This has been hard for me as I have always used Coconut oil and olive oil. 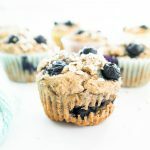 Can I make these without coconut oil? What could I use to replace coconut oil? Please help:). this was delicious! Do you have the nutrition information for this? 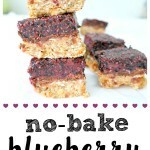 I made these with strawberries in lieu of blueberries and it’s delicious! 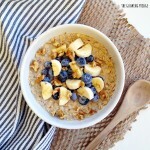 Thank you for this easy breakfast idea! These look so yummy I can’t wait to make them! I’m hoping to make them for a few brunch dates I’ve got coming up so I have something to eat 😉 If I double the recipe, should I put in a 9×13 pan? Will that work? Thanks in advance! I used honey as my sweetener and I forgot to put the lemon juice in (oops). I also used pbfit as my protein powder I’m pretty sure I used 3 tbps. They were delicious!! I was a little nervous about the hemp seeds I’ve never used them before and I wasn’t how they’d go over with my son who doesn’t really like nuts but it passed the test lol. I will definitely be making these again, thank you. Will these freeze well? I’m worried they’ll go bad before I can eat them all! I’m the only one in the family, out of two of us, that will eat these so I want to make them go as far as I can! Made these tonight to start my plant based diet. I had to taste test before I enjoy the these in the morning and they are delicious! I added a little more cinnamon and sunflower seeds. These will be a morning staple for sure! I’m wondering why you say “gluten free rolled oats”? Oats are naturally gluten free. Seems kinda silly. Most conventional oats (like Quaker) are contaminated and not gluten free so I have to specify. They DO make GF rolled oats, as NO, not all oats are gluten free thanks to processing (yes, NATURALLY they’re GF, but in today’s world we can’t just simply buy natural). Why point it out, who really gives a s**t!! She’s posting free recipes. Take it or leave it. I’m pretty sure the Vega clean energy is just an energy supplement/pre-workout drink. The Vega vanilla would definitely work in this recipe too, or any other plant based powder in berry/coconut/vanilla flavors. I order Vega Protein & Greens powder through Amazon all the time though and have never had a problem! You could also order through the Vega or Target websites. In my opinion, Vega tastes the best out of any I’ve tried! I buy Vega Vanilla at our local Wal-Mart stores here in Texas. Looks delicious!! Could I use honey for the sweetener? I’ve already tried these, and the whole family loved them. But do you know if these freeze well? I’d like to make a few batches and freeze, then maybe throw one in the diaper bag if I’m in a hurry. Absolutely love these! I used Good Hemp (Raw Hemp Protein Powder). They have a great texture, perfect amount of sweet. I’m packing them for my husband’s lunches this week! These are amazing. New family favorite. Blueberries have been on sale the last couple of weeks and I will be making more of these very soon. Thank you! These are wonderful when you need something on the go. I just substituted coconut nectar for brown rice syrup….delicious, thanks! What is the calories ? Hey Michelle. I don’t have specific nutrition facts for my recipes… I never count anything and would rather count colors instead of calories. Everything in this recipe is a “whole food” so no need to worry about specific numbers!! Hi there, I’m wondering about the base texture on this. I recently did bars with similar ingredients and method. The base came out kind of spongy and “raw like” no matter how long I baked it. (I know sometimes gf stuff comes out like that so wasn’t shocked). Anyway I’m looking for a bit more crisp/firm base. Will I get that with these? Thanks for your time! They look delicious! These are amazing! 😀 I made them this afternoon and are they ever tasty! They didn’t end up as firm as your photos, but I did put almond butter instead of the protein powder, so I just put them in separate containers which I’ll be bringing to work all week. These look so good! What kind of protein powder did you use? Hi Amy, thanks! I used this berry protein powder from vega: http://rstyle.me/n/bsic59brhkx It’s my favorite lately!! If you didn’t want to use protein powder in these, can you just leave it out or is there a substitution? Thank you! 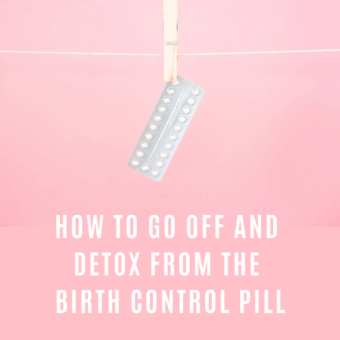 Hi Rachel, yes you can omit the protein powder or sub it for 2 tablespoons of PB2 powder or 1 tablespoon almond butter but they are not necessary – just help to bind the base together a bit more. Should have put this in the recipe. Thanks for asking! !